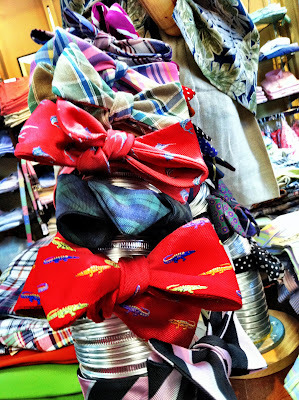 We love holidays around here - especially when they celebrate Southern favorites - like bow ties! Today, August 28, is National Bow Tie Day and we&apos;re giving you a "Bow Tie Guide," letting you know where to shop for the most stylish, necessary component to complete a Southern gentleman&apos;s ensemble and how to tie a bow tie. Beginning with French aristocrats in the 1800&apos;s, bow ties have marked men of distinction for years, and have become a fashion staple of the South. Whether donning one to a cocktail party, formal dinner, business meeting, casual Gamecock tailgate or Devine Street. Pink Sorbet, a Lily Pulitzer store, carries a line of men&apos;s Southern Proper bow ties. And, though she&apos;s known for custom dresses, LaRoque also makes custom and monogrammed bow ties for men. Drop into Brittons to see our YouTube star (and bow tie extraordinaire) Lucky Levinson and his collection of dapper accessories. In his video below - the top bow tie instructional video on YouTube - Lucky shows us &apos;How to Tie A Bow Tie&apos; with Southern flair. Find fun, 100% unique, reversible bow ties from Nana by Sally - a local line of vintage-inspired handbags and accessories made by Columbia, SC designer Sally Peek. If you don&apos;t find her at the All Local Farmers Market on Saturday mornings, Sally welcomes bow tie and accessory lovers into her home studio. Now, that&apos;s a true mark of Southern graciousness! Drop into Brittons to get an in-person lesson from Lucky or Perry. Tell them we sent you, and give them a big "hey y&apos;all" from us! Are you celebrating National Bow Tie Day? Send us a picture of your &apos;famously hot&apos; bow tie today! Tweet it to us or tag us on Instagram, @columbiasc, or tag us on Facebook. Leave a comment below to tell us where you find your favorite bow ties or what item of clothing is southern staple to you.